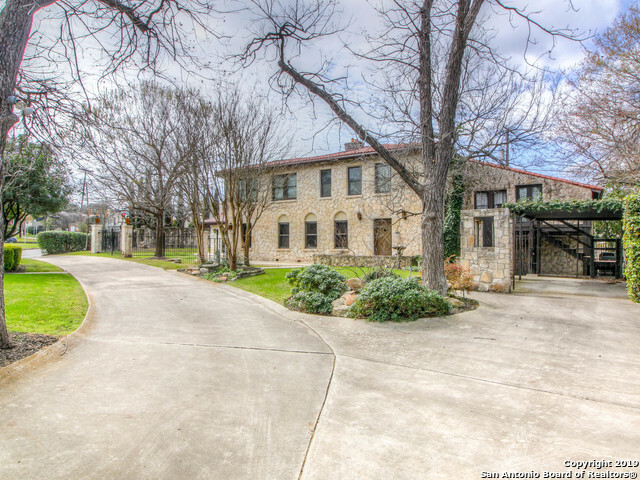 All OLMOS PARK homes currently listed for sale in San Antonio as of 04/22/2019 are shown below. You can change the search criteria at any time by pressing the 'Change Search' button below. "This O'Neil Ford house on a secluded, 1-acre lot is a rare and stunning gem. 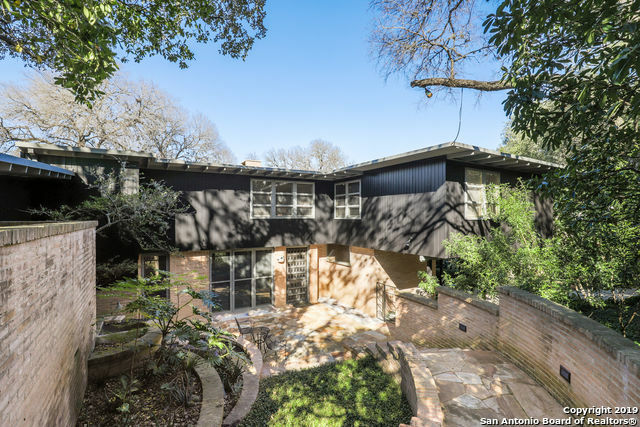 With a spacious main house, 1B/1BR back house and separate artist studio, the property is a sprawling mid-Century compound just minutes from the Pearl and downtown. 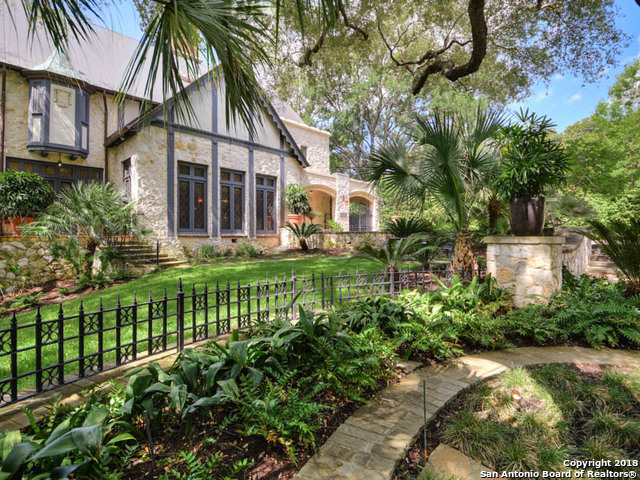 The hillside home features parquet floors and original Lynn Ford cabinetry, plus a hidden vault and elevator, cascading fountain, and a multi-tiered flagstone patio perfect for family gatherings or large parties under a canopy of live oak trees." "This stunning home makes a strong first impression with its stately stone exterior. Two master bedrooms, one on main floor with wood burning fireplace and one on the second level. Two high efficiency tankless water heaters. Wine grotto/cellar (337 sq ft ) with antique wooden doors and with a private entrance. Outdoor stainless grill with granite tops under a covered patio (12 X 48). Storage building with matching stone. Mood lighting thru out home. wrought iron and stone fence in front." "Come see this Italian Rustic style house which has been completely renovated for modern living on a quiet tree-lined street in Olmos Park. It features an all green yard with a large parking court in front and big patio and pool in the back." 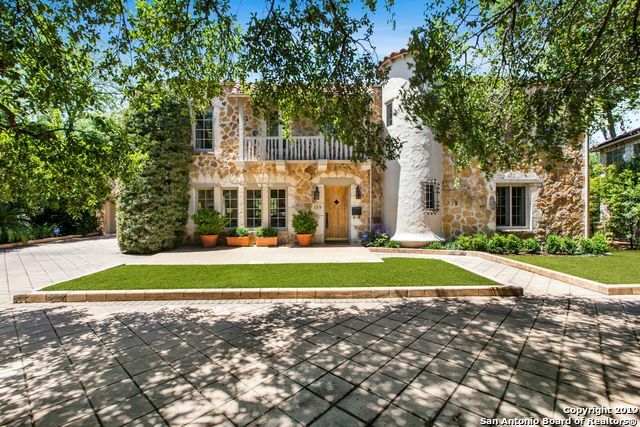 "Magnificent Modern Mediterranean/recently renovated/premier Olmos Park location! Fabulous 1920's architectural details. Culinary kitchen/sleek granite tops/hi-end appliances/gas cooking/coffee bar/oversized utility rm. Magnificent master retreat/luxe Carrera marble bath/walk-in closet/dressing area. Large closet between guest bedrooms could be playroom/office. Study/family room down. Abundance of windows/great natural light. Oversized garage has room for 3 cars. Outdoor patio/built-in gas grill/"
"History with a fresh spin. This home knows how to entertain in impeccable style. Original to Tudor style house, Redondo tile in the entry directs you to the formal living areas & stairway to the 4 upstairs bedrooms, 3 full remodeled baths. 4th bedroom could also be used as a dressing room wt bath. Chefs kitchen wt granite counters, Viking stove, Subzero Refrigerator, wine cooler, family room & sunroom leading to spacious patio and yard with beautiful Heritage Oak increase the entertainment spa"
"Awesome Location with over 4000 square feet and a pool!Versatile floor plan, finished out 3rd floor flex space. Wood floors, black and white tile kitchen floor, 3 fireplaces inside, one poolside. Dual master baths. Downstairs laundry/ mudroom , attached two car garage & two car carport. Priced to Sell!!" "A mix of contemporary design & traditional architecture. 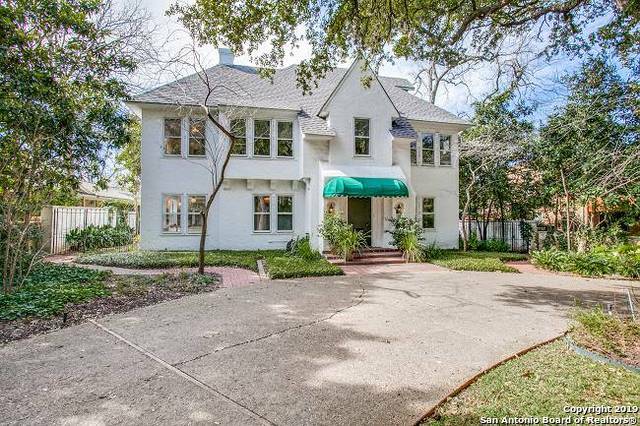 This 4 BR, 3.5 BA incorporates design elements reflective of the Spanish Eclectic style true to Olmos Park, while incorporating state-of-the-art & energy efficient features. High ceilings and open floor plan. Custom cabinetry, quartz counter tops and high end stainless steel appliances featured in the island kitchen." "A mix of contemporary design & traditional architecture. 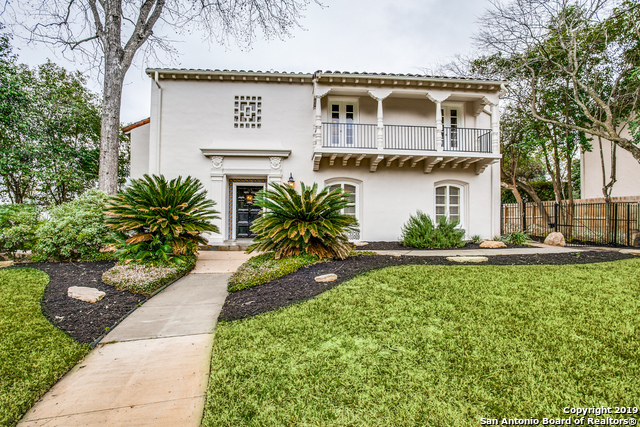 This 4 B, 3.5 BA incorporates design elements reflective of the Spanish Eclectic style true to Olmos Park, while incorporating state-of-the-art & energy efficient features. High ceilings and open floor plan. Custom cabinetry, quartz counter tops and high end stainless steel appliances featured in the island kitchen. Split master. Detached two car garage. This new home is move-in ready!" "Contemporary design & traditional architecture meet in this 4 bedroom 3 bathroom home. Design elements reflective of the Spanish Eclectic style true to Olmos Park are combined with PSW's state-of-the-art & energy efficient features in each of these spectacular homes. Wood flooring throughout and porcelain tile in bathrooms. High ceilings. Open floor plans. This home is move-in ready!" 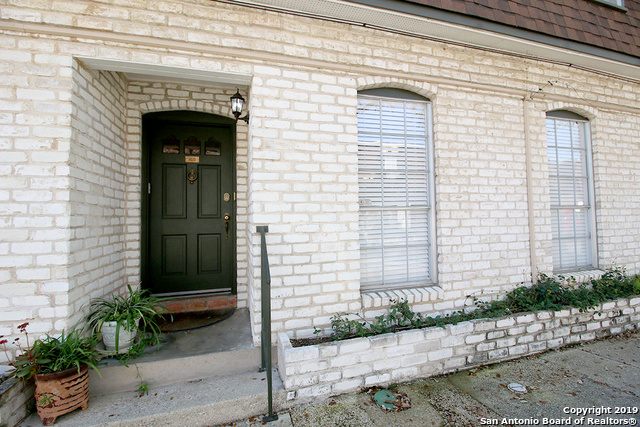 "You need to see this one-of-a-kind 2 story condo located in historic Olmos Park w/ close proximity to Incarnate Word & Trinity University, Landa Library & many local restaurants & businesses. This ideal location is a 15 minute drive to downtown w/ many options that avoid fighting highway traffic. Large oak trees line entrance & main drive of community. This 2 story condo opens up to a large dining area & newly renovated custom kitchen w/ granite countertops, custom cabinets & a walk-in pantry"